Maple Cream Doughnuts were my actual favourite doughnut to get from Tim Horton’s. This vegan maple cream doughnut recipe makes soft, puffy doughnuts filled with smooth maple pastry cream topped with a buttery brown sugar maple glaze. Deep fry them for the most scrumptious result or bake them or use your air fryer for a lower fat option that requires less attention and is easier to clean up afterwards. Click here for the printable recipe. For a few semesters in college, I’d have a funny schedule with four-hour breaks between classes. With not too many options on campus, I practically lived on (or was it lived for?) maple cream doughnuts and double doubles. One might think I’d be sick of them by now. Not so. Every time I bite into a maple glazed pastry, I’m taken back to a time when possibilities were endless, the sun shone bright, and Canadian pride could be reignited with the aromatic sweetness of maple syrup. Tim Horton’s Maple Creams has plain pastry cream on the inside; the same as their Boston Cream Doughnuts. This version adds a bit more maple flavour on the inside. Conversely, my glaze is not as heavily maple-y as theirs. I think they must use extra flavouring. My maple glaze relies on natural flavours which are not as strong. Overall, it’s slightly less sweet than the doughnut shop version…as far as I can remember. 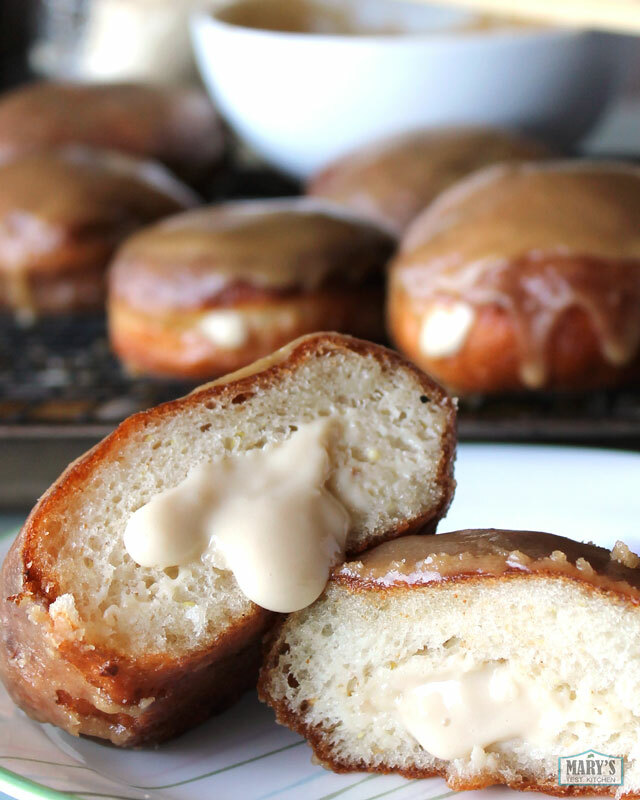 I hope you try these vegan maple cream doughnuts and let me know what you think! This vegan maple cream doughnut recipe makes soft, puffy doughnuts filled with smooth maple pastry cream topped with a buttery brown sugar maple glaze. Deep fry them for the most scrumptious result or bake them or use your air fryer for a lower fat option that requires less attention and is easier to clean up afterwards. Makes 9 small doughnuts, about 2/5" diameter. Combine the flour, ground flax/chia seed, vital wheat gluten, and instant yeast in a mixer, food processor, or large mixing bowl. If you'll be baking these doughnuts also add baking powder for extra leavening power. Mix to combine. Add melted vegan butter or refined coconut oil, sugar, vanilla extract and, optionally, ground nutmeg. Add the warm water. Process/mix until a soft, sticky dough comes together. Let this dough rest for 15 minutes so the flour and flax/chia can fully hydrate. Whisk all the pastry cream ingredients together in a small sauce pan until no lumps remain. Heat over medium high heat while stirring until the mixture becomes thick and bubbly. Lower the heat to medium low and continue stirring for a minute while the mixture thickens into a pudding-like consistency, then remove from heat. Alternatively, use your microwave: cook on high about 2 minutes, stirring every 30 seconds so it cooks evenly and doesn't bubble over. When cool enough to put in the fridge, cover it with plastic wrap right against the surface, minimizing any air pockets. The pastry cream needs to be chilled before piping into cooked doughnuts. 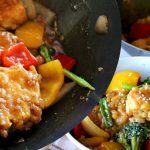 You can make this ahead and store in the fridge for up to 3 days. 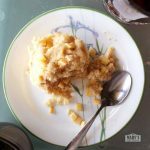 Combine the maple syrup and brown sugar in a microwave safe bowl. Heat for 30 to 45 seconds, stopping every 15 seconds to stir, until the brown sugar has melted. Add vegan butter and stir until completely incorporated. Add vanilla extract and half of the icing sugar. Stir until incorporated, then add the remaining icing sugar. Whisk until the mixture is smooth. Cover it with plastic wrap right against the surface. This will prevent a hard crust from forming. Set aside at room temperature. You can make this ahead and store in the fridge for up to a week. Lightly flour your clean work surface and transfer the dough to it. Knead the dough for a minute; it will become more elastic and bouncy. Cover it again and let rest for 15 minutes to allow the gluten to relax and making rolling out easier. Roll the dough out to 1/4-1/2 inch thickness or just a bit thinner (I used the width of my index finger as a guide). Use a round cutter 2.5" in diameter, cut out the doughnut shapes (I used the rim of a cup for this). When you run out of dough, gather the scraps into a ball and roll out to cut more out. This recipe will make 9 2.5" diameter rounds. If you are frying (or air-frying) your doughnuts, place the rounds on a parchment lined baking sheet dusted lightly with flour. Or if you don't have parchment paper, generously dust a baking sheet with flour and use that. Either way, leave room between the rounds so they can double in size without touching. If you are baking the doughnuts, place the rounds directly on a parchment lined baking sheet. Cover the rounds with plastic wrap dusted with flour (flour side down) or a damp lint-free cloth and let rise in a warm location for 45 minutes to an hour or until doubled in size. Heat an inch or two of a neutral flavoured oil, like canola, in a heavy bottomed pot over high heat to 350°F. See video for visual cues that the oil is hot enough. Use a slotted spoon or spatula to gently lift a donut off the baking sheet, brush off excess flour, and carefully lower into the oil oil. Cook for 45 seconds or until the bottom is golden brown. Flip and cook for 30-45 seconds longer or until that side is also golden brown. Transfer to a paper-towel lined wire rack to cool. Repeat with all the donuts, frying one or two at a time. Keep an eye on the temperature and adjust as needed to keep it at 350°F. The the oil temperature is too cool, the doughnuts will cook more slowly and be more greasy at the end. If the oil temperature is too hot, the doughnuts may puff up too much, creating a large air pocket that makes for a messy cream situation. Let the cooked doughnuts cool to room temperature before filling and glazing. Preheat oven to 350°F. When the oven reaches temperature, bake doughnuts for 10 minutes. Remove from oven immediately. The doughnuts should be just cooked through, white on top and slightly browned on the bottom. Transfer to a wire rack and let cool to room temperature before filling and glazing. Preheat air fryer for a few minutes to 360°F or according to manufacturer's instructions. Meanwhile, lightly oil the bottom of the pan and place two doughnuts in. They should fit without overlapping. When the air fryer is preheated, pop the pan in and air fry for 4-5 minutes. The doughnuts will come out lightly golden on top, resembling dinner buns more than deep-fried doughnuts. 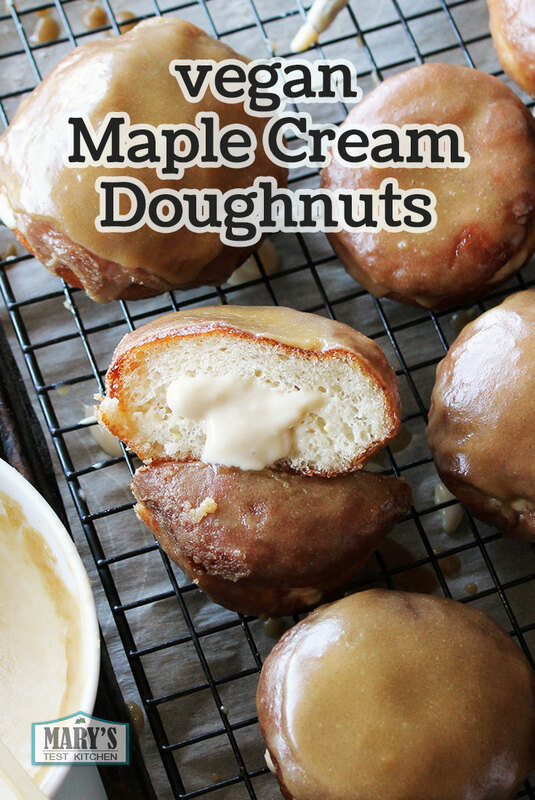 But once finished with cream and glaze, they will be excellent healthier Maple Creams! Transfer to a wire rack immediately and let cool to room temperature before filling and glazing. Use a chopstick to poke a hole into the side of each doughnut. Wiggle it around a bit to create a pocket for the cream. Loosen the pastry cream blending it thoroughly with an immersion blender. Or you can whisk it by hand. In that case, I recommend passing the cream through a seive to make it super smooth. Fill a piping bag with a suitable tip with the pastry cream. I used a #230. Pipe the filling into each doughtnut evenly. Remove the plastic wrap and stir the glaze well with a whisk to dissolve any bits that have hardened. It should be smooth and creamy. If it's too thick, reheat it slightly over low heat on the stove or for about 10 seconds in the microwave. If you have chilled this glaze previously, try to warm it up just to room temperature. If the glaze becomes too warm, it will become too thin. 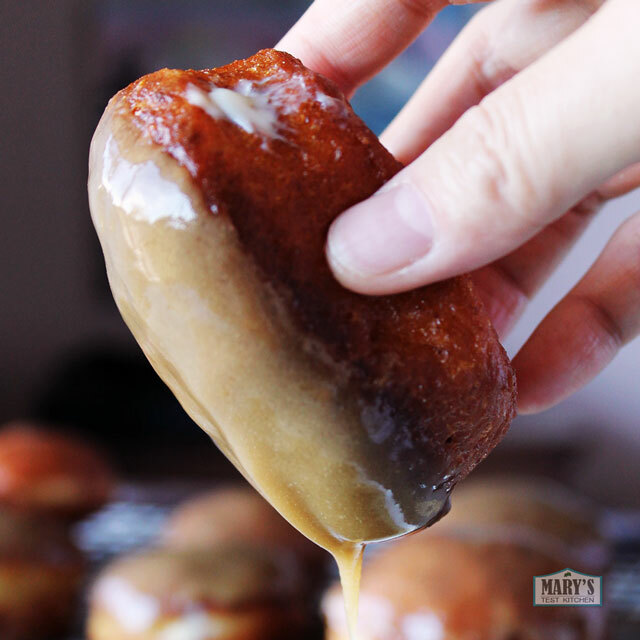 Dip each doughnut into the glaze carefully, allow the excess glaze to drip off, then place back on to the wire rack. While you can enjoy them right away, you may wait about 30 minutes for the glaze to set; depending on the temperature and humidity of your kitchen. **Vital Wheat Gluten adds springiness and chewiness to the final product. If you cannot get it, use 1 1/4 cups plus 2 tablespoons bread flour instead of all-purpose flour. Oh wow, these are the stuff my maple-y dreams are made of! Such a wonderful recipe! Vital wheat gluten in a donut? Interesting–I’ll be getting in a good amount of protein for each donut then! LOL! haha thanks, though it’s not a lot of extra gluten. Oh my lord. It looks too good to be true. Thank you so much for the recipe! Hi Mary! Tried these out, but my dough didn’t rise. What did I do wrong? It’s ok I ended up with some tasty biscuits anyways. 🙂 also I used a gluten free flour, could that be the culprit? This recipe has not been tested using gf flour. The gf flour may very well be your culprit. I’m glad it wasn’t a total waste for you though! Hi! Can you refrigerate the dough ahead of time? Yes, overnight is fine. I wouldn’t do it any longer than that.